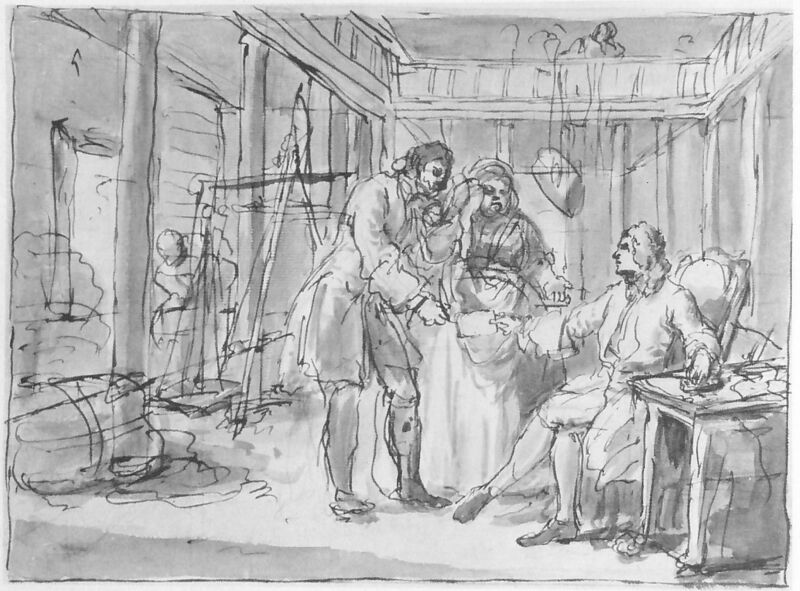 William Hogarth (1697–1764), The Idle 'Prentice return'd from Sea and& in a Garret with a Common Prostitute (sketch) (Industry and Idleness 7) (1747), pen and ink over pencil with Indian ink wash on paper, 21.3 x 29.5 cm, British Museum. Scanned from Ayrton & Denvir (1948). My previous article looked at the first half of Hogarth’s narrative series of prints, Industry and Idleness (1847); this looks at the remaining prints in the series, using the same format. William Hogarth (1697–1764), The Idle ‘Prentice return’d from Sea, & in a Garret with a Common Prostitute (finished print) (Industry and Idleness 7) (1747), engraving, 25.7 x 34 cm. Wikimedia Commons. Idle has returned from his time at sea, and is now living in appalling conditions in a garret in London, with a woman who is working as a prostitute. 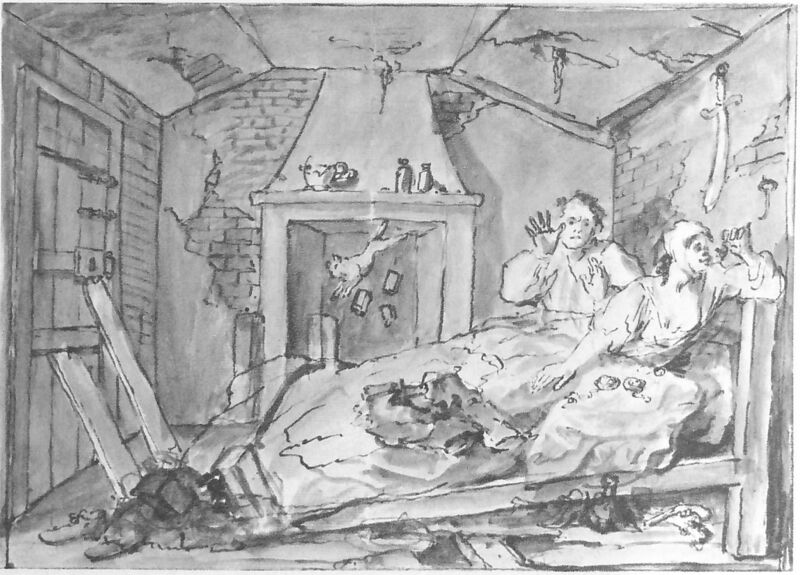 The couple are shown in bed in utter squalor: the room is unfurnished apart from a broken double bed, and walls and ceiling in disrepair, there is no fire in the hearth, and floorboards have been ripped up to help prevent anyone from forcing the door open. There is no light either, and the woman’s hooped petticoat has been draped over a small window for seclusion and secrecy. The room is strewn with stolen goods, and there is a pair of pistols, suggesting that Idle is now a highwayman or footpad, who holds up and robs travellers. A couple of hunter watches are laid out on the sheet by the woman, and she is studying an earring which has the appearance of the gallows. Idle is agitated by a cat which is just falling down the chimney, bringing with it three loose bricks. William Hogarth (1697–1764), The Industrious ‘Prentice grown Rich, & Sheriff of London (finished print) (Industry and Idleness 8) (1747), engraving, 25.4 x 34 cm. Wikimedia Commons. The contrast with Goodchild’s situation could hardly be greater. 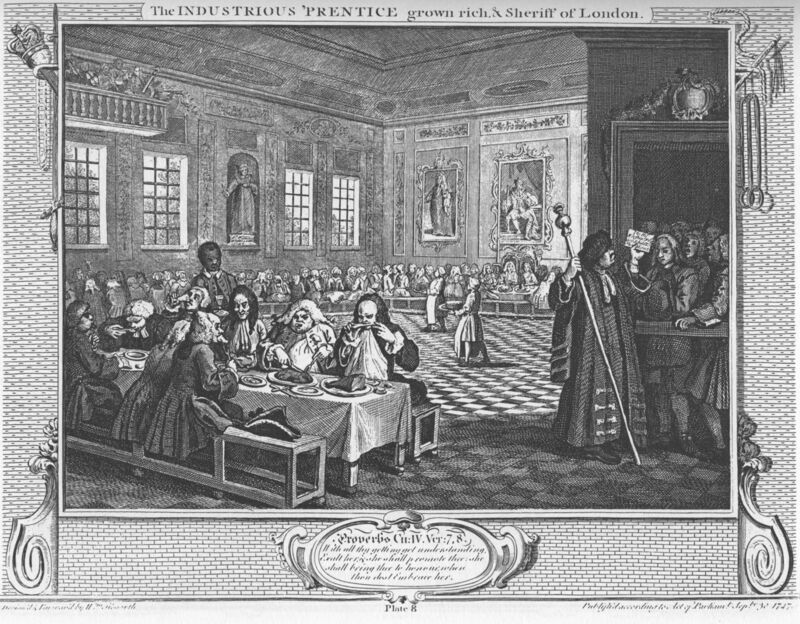 Goodchild and his wife sit presiding over a great banquet held in Fishmongers’ Hall, London: they occupy the almost regal seats at the far side of the hall, under the large portrait of William III. The guests nearest the viewer are shown over-indulging in their food, several of them already very obese. A beadle stands at the right, controlling a crowd of onlookers and checking invitation tickets. The statue is of Walworth, who killed Wat Tyler, the leader of the 1381 Peasants’ Revolt. 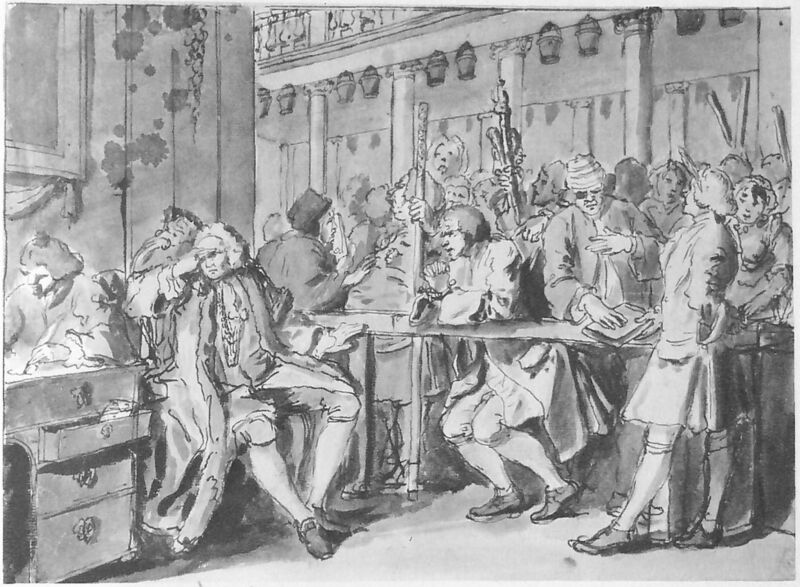 A group of musicians is perched on a gallery at the top left, to entertain the diners, and several waiting staff attend to those at the tables. 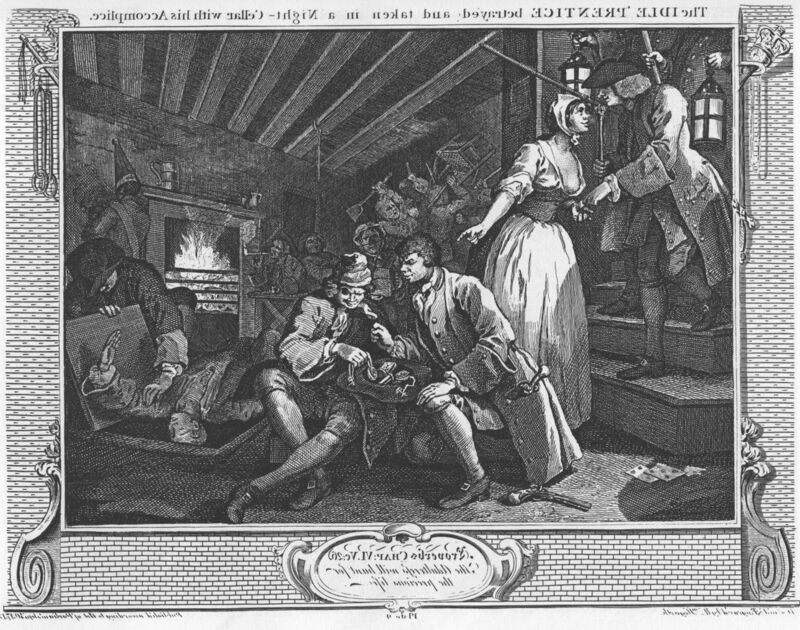 William Hogarth (1697–1764), The Idle ‘Prentice betray’d by his Whore, & Taken in a Night Cellar with his Accomplice (finished print) (Industry and Idleness 9) (1747), engraving, 25.7 x 34 cm. Wikimedia Commons. Idle and his accomplice are shown dividing the spoils from their latest crime, while another pushes the dead body of the victim through a trap-door into the cellar. Set in the main bar of a dive traditionally known as Blood Bowl House, there is a roaring fire in the grate, and in the background a fight is in progress, with chairs being thrown. Immediately behind Idle, his woman is pointing him out to the officers of the law, who are arriving from the left. In return for this, she is given a single coin. Idle’s arrest is imminent, and he will be caught red-handed. William Hogarth (1697–1764), The Industrious ‘Prentice Alderman of London, the Idle One Brought before him and Impeach’d by his Accomplice (finished print) (Industry and Idleness 10) (1747), engraving, 25.4 x 33.7 cm. Wikimedia Commons. Hogarth brings the two former apprentices back together for a final reckoning. Goodchild, by virtue of his office, sits as a magistrate; he is shown in the centre right, shielding his eyes from the sight of Idle, who is pleading with him, his hands clasped in prayer. 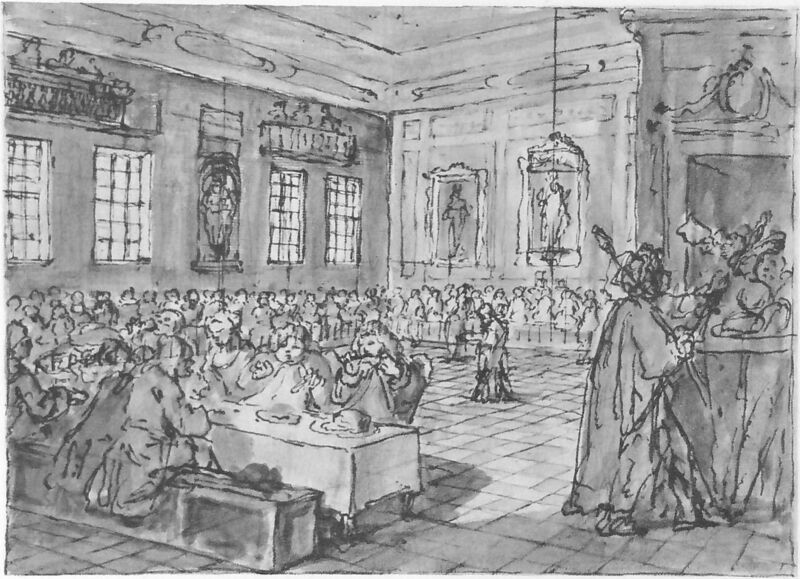 To the right of Idle, his accomplice in crime is seen taking the oath, about to turn King’s evidence, and provide the information needed to convict Idle. Behind them another person holds up the sword and pistols used in his crimes. Hogarth is also able to incorporate some touches of satire: the court official who is administering the oath has tucked his quill pen in his wig, to make himself look ridiculous. 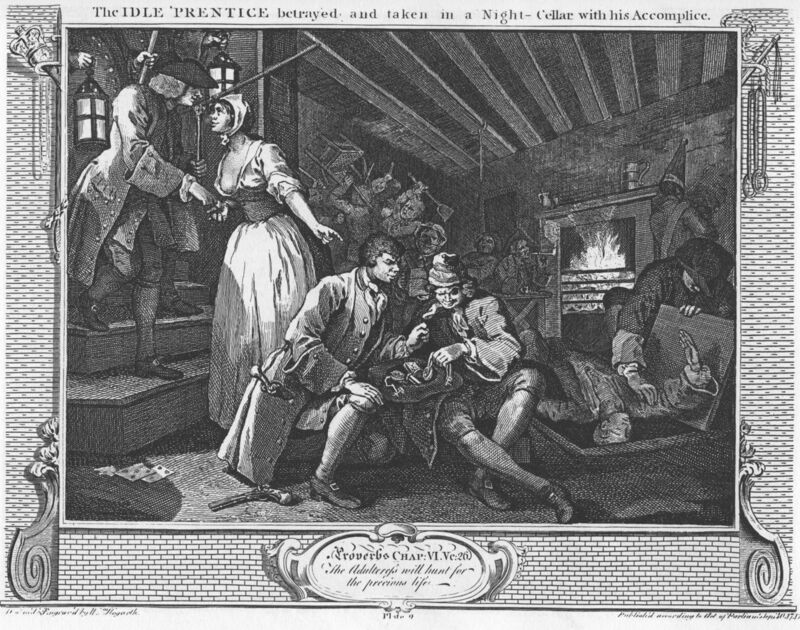 His right hand is held out behind him to receive some money, being paid by the well-dressed woman at the left edge of the print; it is not clear who she is, but the bribe is being given so that the official does not notice that Idle’s accomplice is swearing his oath with the wrong hand on the Bible, therefore invalidating it. At the far right, completing the peripeteia, Goodchild’s clerk is seen writing out the warrant for Idle to be confined to Newgate jail. 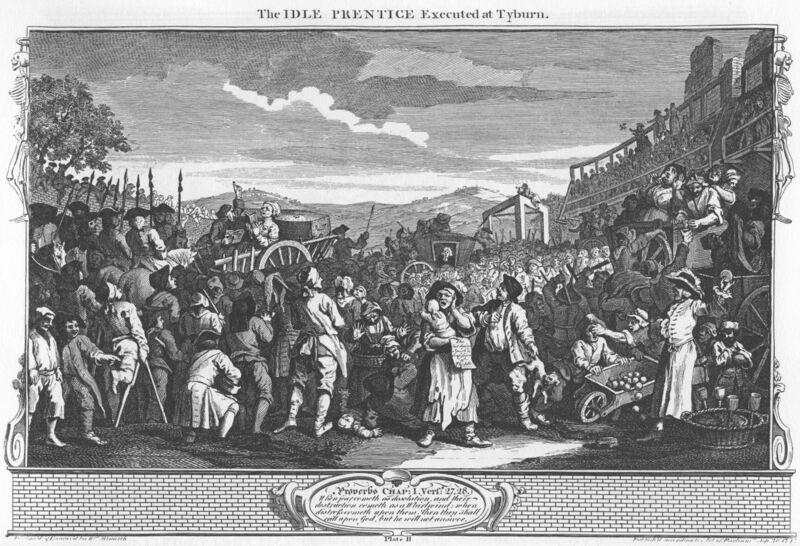 William Hogarth (1697–1764), The Idle ‘Prentice Executed at Tyburn (finished print) (Industry and Idleness 11) (1747), engraving, 25.7 x 40 cm. Wikimedia Commons. 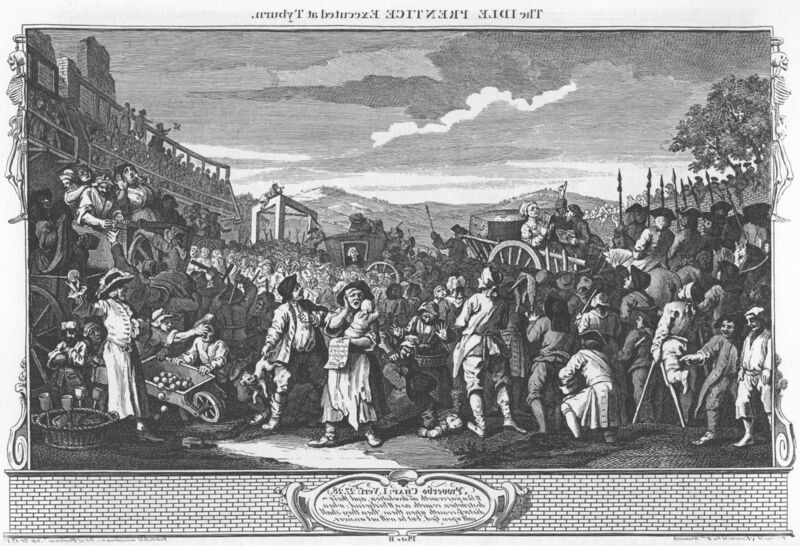 Idle, having been found guilty of murder, has been sentenced to death, and is here shown being taken by cart to the gallows at Tyburn, which are prominent above the crowd in the right middle distance. The hangman is shown below the gallows, adjusting the length of the noose to ensure a swift death. Someone is nonchalantly perched on top of the gallows, smoking a pipe. Idle is in the back of the cart just to the left of centre, reading, presumably from a prayerbook, accompanied by a Wesleyan minister who appears to be exhorting his repentance, and is stood with his back to his empty coffin. Soldiers follow that cart, and a dense crowd has already gathered to witness the hanging. All manner of minor events is taking place among the crowd, which resembles that of one of Frith’s much later panoramas, such as Derby Day. From the window of a coach in the centre, the Ordinary of Newgate is addressing the crowd, in accordance with the will of Robert Dow, a merchant who left money to ensure that spiritual exhortations were provided for those about to die on the gallows. The fields in the distance are those of Notting Hill, long since built over. 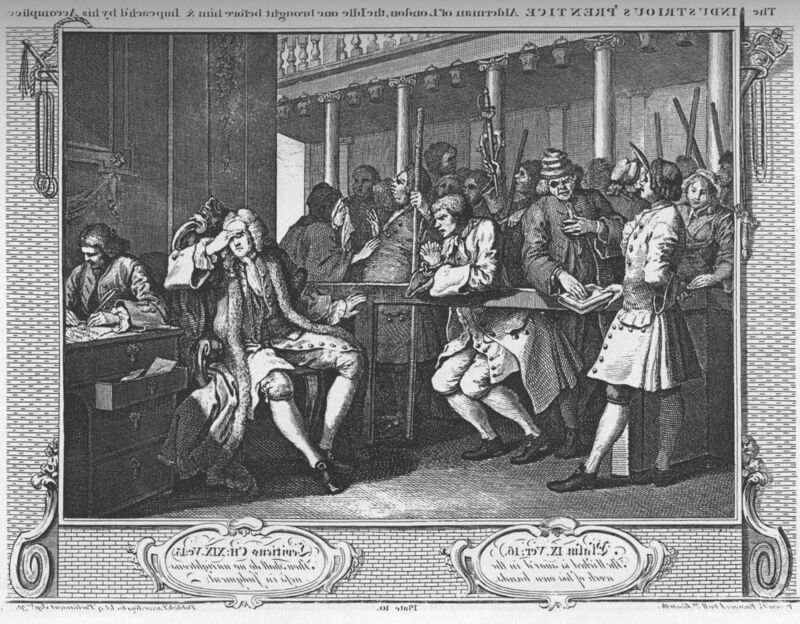 William Hogarth (1697–1764), The Industrious ‘Prentice Lord Mayor of London (finished print) (Industry and Idleness 12) (1747), engraving, 26.4 x 40 cm. Wikimedia Commons. 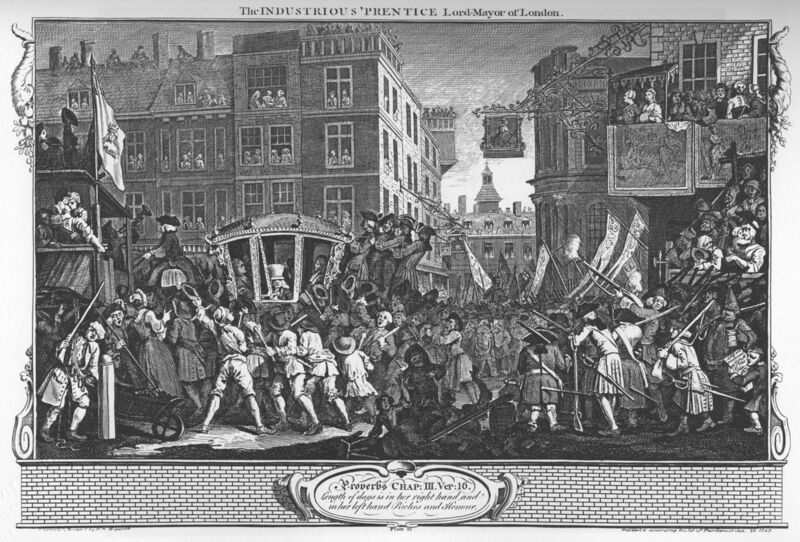 Goodchild’s fate is far more glorious: he is chosen to be Lord Mayor of the City of London, and here is riding ceremonially in the official carriage, among the crowds thronging the streets of the city. He is inside the carriage, brandishing the sword of office and wearing an outsized white top hat. Among the crowd are members of a local militia, one of whom accidentally discharges his gun. At the far right a boy is selling an account of Idle’s execution, which places him in the Newgate Calendar, his mark of posterity. Here I show the remaining preparatory drawings for those prints, together with a mirrored version of the print. Plate 8 is an exception: the print shows no reversal from the original drawing. That may be the result of an error which resulted in the reversal of the drawing for that plate, or it may have been engraved directly in mirror version. There are no preparatory drawings available for the final print, number 12 in the series. William Hogarth (1697–1764), The Idle ‘Prentice return’d from Sea and& in a Garret with a Common Prostitute (sketch) (Industry and Idleness 7) (1747), pen and ink over pencil with Indian ink wash on paper, 21.3 x 29.5 cm, British Museum. Scanned from Ayrton & Denvir (1948). 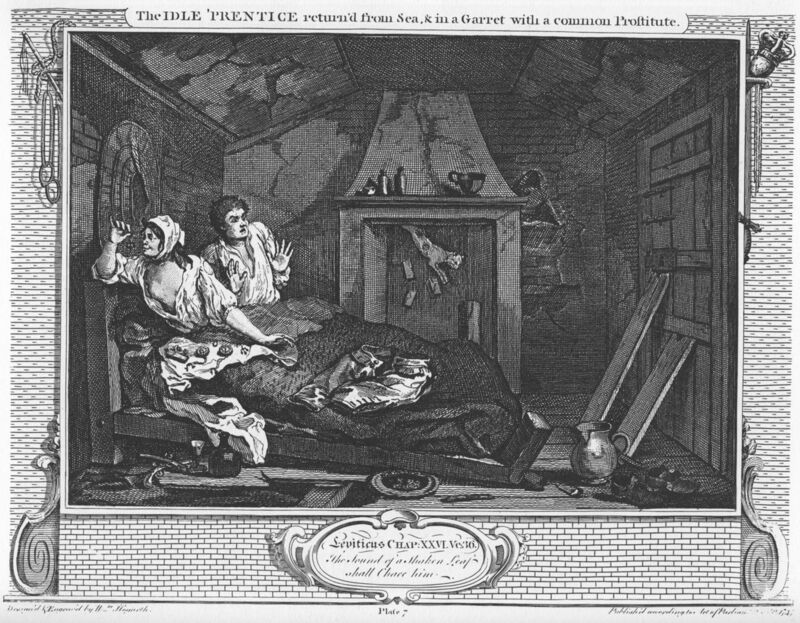 William Hogarth (1697–1764), The Idle ‘Prentice return’d from Sea, & in a Garret with a Common Prostitute (finished print, mirrored) (Industry and Idleness 7) (1747), engraving, 25.7 x 34 cm. Wikimedia Commons. William Hogarth (1697–1764), The Industrious ‘Prentice grown Rich and Sheriff of London (sketch) (Industry and Idleness 8) (1747), pen and ink with Indian ink wash on paper, 26.4 x 32.4 cm, British Museum. Scanned from Ayrton & Denvir (1948). 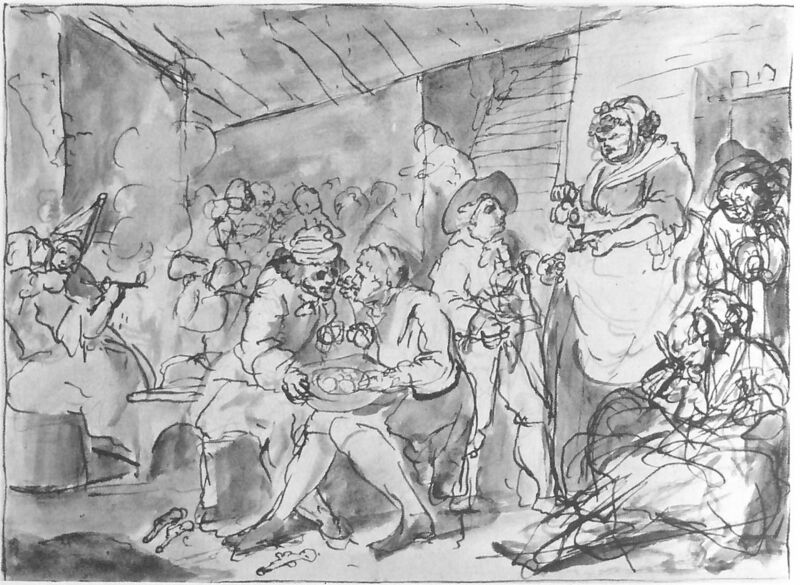 William Hogarth (1697–1764), The Idle ‘Prentice betray’d by his Whore and Taken in a Night-Cellar with his Accomplice (sketch) (Industry and Idleness 9) (1747), pen and ink with Indian ink wash on paper, 26.4 x 32.4 cm, British Museum. Scanned from Ayrton & Denvir (1948). 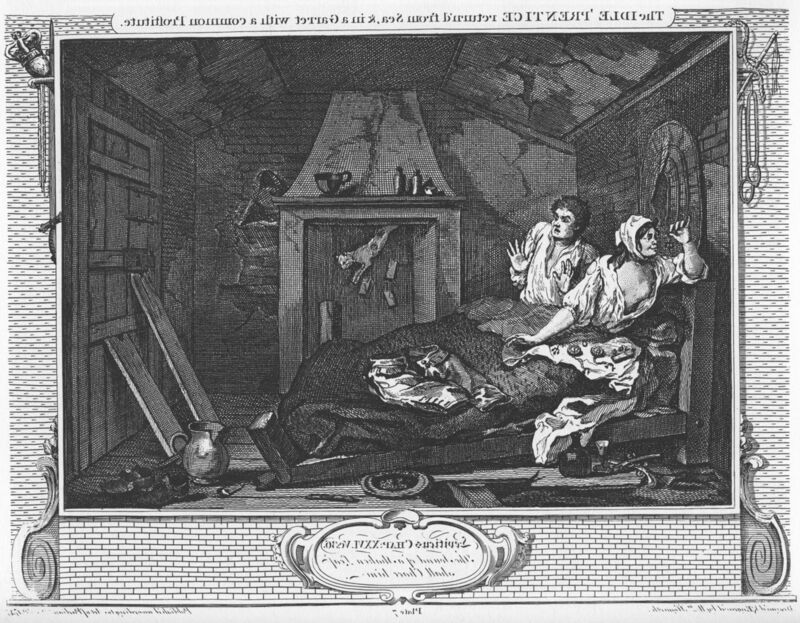 William Hogarth (1697–1764), The Idle ‘Prentice betray’d by his Whore, & Taken in a Night Cellar with his Accomplice (finished print, mirrored) (Industry and Idleness 9) (1747), engraving, 25.7 x 34 cm. Wikimedia Commons. William Hogarth (1697–1764), The Industrious ‘Prentice Alderman of London, the Idle One Brought before him and Impeach’d by his Accomplice (sketch) (Industry and Idleness 10) (1747), pen and ink with Indian ink wash on paper, 21.6 x 29.2 cm, British Museum. Scanned from Ayrton & Denvir (1948). William Hogarth (1697–1764), The Industrious ‘Prentice Alderman of London, the Idle One Brought before him and Impeach’d by his Accomplice (later drawing) (Industry and Idleness 10) (1747), pen and ink with Indian ink wash on paper, 21.6 x 29.2 cm, British Museum. Scanned from Ayrton & Denvir (1948). William Hogarth (1697–1764), The Industrious ‘Prentice Alderman of London, the Idle One Brought before him and Impeach’d by his Accomplice (finished print, mirrored) (Industry and Idleness 10) (1747), engraving, 25.4 x 33.7 cm. Wikimedia Commons. William Hogarth (1697–1764), The Idle ‘Prentice Executed at Tyburn (finished drawing, two scans joined imperfectly in centre) (Industry and Idleness 11) (1747), Indian ink on paper, 23.2 x 39.1 cm, British Museum. Scanned from Ayrton & Denvir (1948). 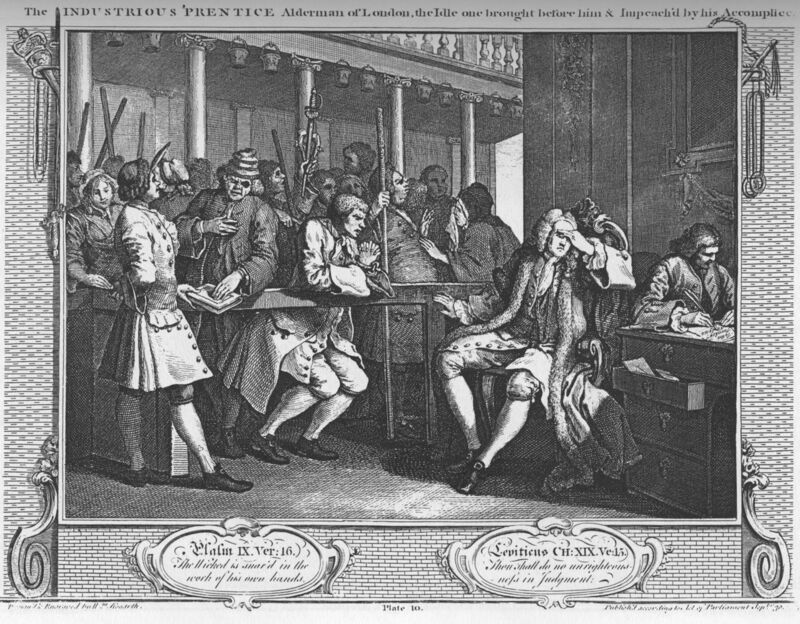 William Hogarth (1697–1764), The Idle ‘Prentice Executed at Tyburn (finished print, mirrored) (Industry and Idleness 11) (1747), engraving, 25.7 x 40 cm. Wikimedia Commons. 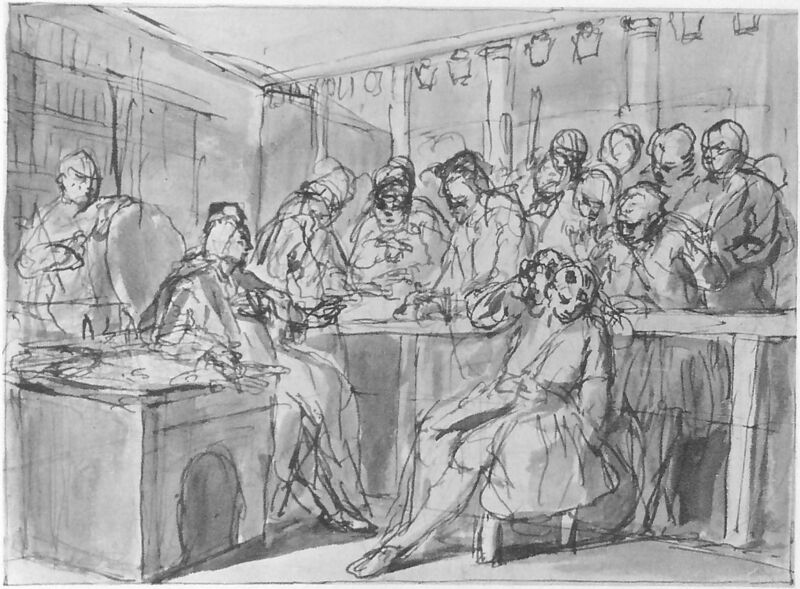 Hogarth also made drawings for at least two in the series which did not progress as far as engraving. 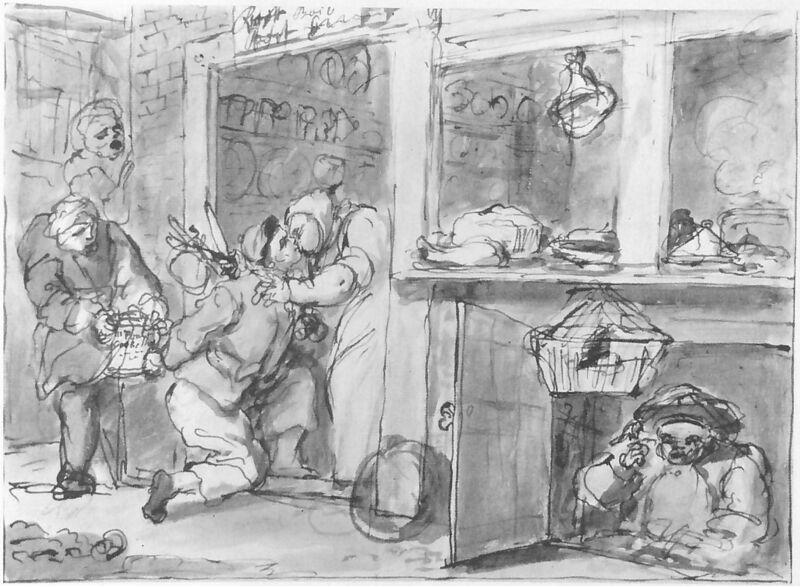 William Hogarth (1697–1764), The Industrious ‘Prentice when a Merchant, Giving Money to his Parents (drawing) (for Industry and Idleness but unused) (1747), pen and ink with Indian ink wash on paper, 24.1 x 29.2 cm, British Museum. Scanned from Ayrton & Denvir (1948). This shows Goodchild, seated, giving money to his father and mother, as a good son was expected to when he had become wealthy. Two other figures are shown: one lowering a bundle of goods from the balcony above, the other weighing goods on a large balance to the left. This might have replaced either plate 8 or 10 in the series, but was clearly abandoned at this stage. William Hogarth (1697–1764), The Idle ‘Prentice Stealing from his Mother (sketch) (for Industry and Idleness but unused) (1747), pen and ink with Indian ink wash on paper, 21.8 x 29.5 cm, British Museum. Scanned from Ayrton & Denvir (1948). Here Idle is seen kneeling at the door of his mother’s shop, she kissing him, while he passes a stolen tankard to an accomplice behind him. The letters on the tankard apparently spell out Fowler Cook-Shop, Fowler being Hogarth’s original working name for Idle. Above the door, the words Roast and Boil indicate that Idle’s mother runs a cook-shop, an early form of eating house with a very poor reputation. Various dishes are shown on the prominent shelf. Below them a person emerges from the basement, with a bird perched on their right hand, and another bird in a hanging cage. From a commercial view, going straight from drawings to prints without the intermediate step of paintings was highly successful. 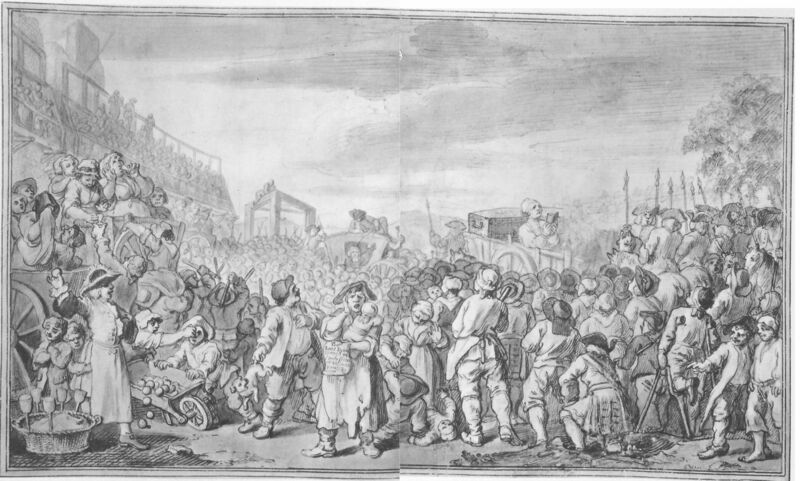 It enabled Hogarth to produce this large series within a year, rather than the two or three years which might have been required for a similar series worked through oil paintings. The end result is not as rich in detailed cues, clues, and symbols as his earlier series, though. He has, for example, made no use of his paintings within a painting, something characteristic of his earlier series. However those subtleties did not transfer well into black-and-white prints. Hogarth also made it clear that he wanted this series to have wide appeal, which required the images to be easily read. Although that might have been in pursuit of greater sales, I think that he did feel a genuine need to disseminate his moralistic message as widely as possible. A short MA dissertation here. Hallett M (2000) Hogarth, Art & Ideas, Phaidon Press. ISBN 978 0 7148 3818 2. Posted in General, Painting and tagged drawings, engravings, Hogarth, narrative, prints, sketch. Bookmark the permalink. Who protects your health data?